If you practice yoga, you know how how challenging it can be to keep both you and your mat smelling clean and fresh after a session. You don't want to use just any old cleaner to clean and freshen your mat because you know they are full of toxins and could damage your mat and your health. And you don't always have time to take a shower after yoga which leaves you feeling and smelling less than fabulous. So what is a yoga lover to do? Meet mother and daughter duo, Sunday and Madison Witte, and their sustainable 100% bamboo Yogini Cleanies™. Sunday and Madison are both practitioners of Yoga and have been since Sunday brought Madison to her first class at 8 years old. 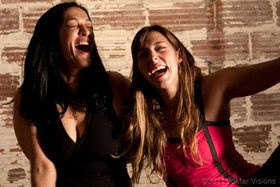 14 years later, they started Yogini Cleanies together and they both feel really good about sharing their green living, multi-use wipes with other lovers of yoga. Created by Sunday and Madison out of necessity and made with bamboo and certified organic essential oils out of a love for green living and sustainability, Yogini Cleanies are a must have for every yoga lover. Yogini Cleanies are a one of a kind, quick, easy to use, sustainable solution for you and your mat to stay clean and fresh. But don't be surprised when you open a packet because these aren't your run of the mill wipes. Because they are made from 100% bamboo, they aren't bleached white like other wipes and they are very soft against your skin yet super sturdy for cleaning your mat. Plus, because they are made with certified organic essential oils, both available scents (Lavender and Lemon Grass) have a superior aroma to other wipes. 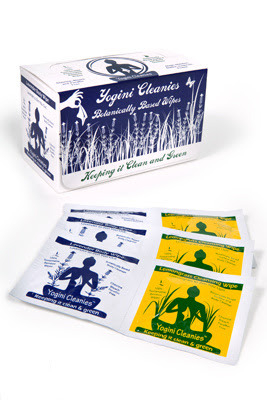 I love Yogini Cleanies because they are an excellent, sustainable solution for cleaning up after yoga, but I think they are great to use for a little refresher when traveling or whenever you need a little pick me up. How perfect would a little refresher with a Yogini Cleanie be after work before you head out to meet friends or before heading out after a few hours with your little ones at home? Head over to Yogini Cleanies website now and learn more about this mother and daughter duo and pick up a pack to try today. I have a feeling you too will fall in love with these most sustainable and multi-use Yogini Cleanies.